Steamrolling their way through the death metal scene with new album "Never To Dawn", Maltese five-piece BEHEADED are delivering on the promise of their 2004 signing to US tech death powerhouse Unique Leader. Forming in 1991, BEHEADED’s brand of pummelling brutal death metal raised eyebrows (and horns) and garnered critical acclaim even from their first album, 1998 "Perpetual Mockery", making them one of the few bands who have consistently delivered, without compromise or let-up, over the decades. One of the scene’s true superstars - a Mediterranean answer to HATE ETERNAL - BEHEADED are set to whip up a storm in the pit at OBSCENE EXTREME 2013. November 2012 saw the release of 'NEVER TO DAWN' an album which has been regarded by many as one of top 10 death metal releases for 2012. Come 2013 Beheaded was added to the roster of DOOMSTAR BOOKINGS and the embarked on CASTIGATING EUROPE a 16 date long tour across Europe with NYC veterans PYREXIA. Work on the new album entitled NEVER TO DAWN has been completed. Music was recorded at Temple Studios Malta while vocals were recorded at 16th Cellar Studio in Rome (Italy) with producer Stefano Morabito, alongside mixing and mastering of the album. The set date for the official release of NEVER TO DAWN is set to November 6th 2012 via Unique Leader Records. Beheaded regrouped its writing core and started stitching together the successor to Ominous Bloodline. Along Chris (Drums), Omar (guitars) and Dave (bass) the band welcomed Frank (vocals) and Robert (guitars) to its fold. 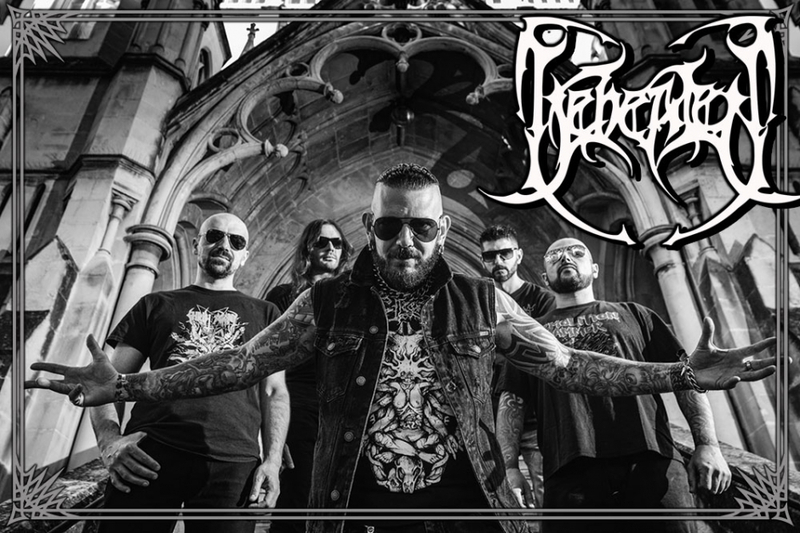 The new line up which without doubt is one of the strongest since the bands inception started work on the successor of Ominous Bloodline whilst hitting the road once a number of times again taking the stage at festivals such as Neurotic Death Fest, Death Feast Open Air, Mountains of Death. Beheaded inked a new record deal with US label Unique Leader Records in April 04. The Ominous Bloodline album was recorded in July / August 04, at Temple Studios, Malta and Mastered at Imperial Mastering US. Ominous Bloodline featured praised tracks like Esoteric Kin, Conceived to Dominate and Rooted in Profundity. The album was launched officially on March 8th, 2005. It marked a significant step forward for Beheaded on all fronts. Lots of touring and festival presences followed and the album was received with great acclaim in the death metal circuit. Ominous Bloodline nailed the band in the major league of extreme music. Early 2002 saw the release of Recounts of Disembodiment on Denmarks Mighty Music, an album which went down exceptionally well with the followers of this extreme form of music. Positive reviews cropped up from every where in every country, and countless of interviews were done in numerous underground publications. A 9/10 review in Terrorizer made the bands day for sure! Mighty Music also licensed the Resurgence of Oblivion MCD, and Recounts of Disembodiment CD to US label Forever Underground Records. April and May 2002 was the time when the first US tour took place. Such tour included over 20 shows and boasted appearances at the Ohio Deathfest and New Jersey Metal Meltdown. Way back to Europe, Beheaded took part in the F*ck the Commerce V festival in Germany. The bands sheer brutality on stage was something that was praised by many. 2004 saw the band hit the European roads again on the Beheaded Europe with Prejudice Tour along friends and Belgian maimers Prejudice. A promo disc was recorded in 1999. The 5 tracks on the promo captured the attention of several record labels. However, the band opted to sign with Danish Label Mighty Music. The same five tracks were released as the Resurgence of Oblivion Mini CD. Such release left its indelible mark in the brutal underground scene and was again praised in countless publications. The new songs also went down extremely well during live performances. Enter 2001. During this year Beheaded wrote all songs for the upcoming Recounts of Disembodiment full Length in between January and May 01. The recording took place once again at Temple Studios in June01, with friend and sound engineer, David Vella behind the mixing desk. The European Extermination Tour took place allover Europe in July 01 which saw Beheaded headlining alongside label mates Anasarca. Beheaded pounded the Obscene Extreme Festival (CZ) stage whilst on tour. 2001 was the year when Chris got endorsed by Paiste Cymbals for his abilities behind the skins. 1996 saw the band signing its first Record Deal with Swedens X-Treme Records. The first official full length was recorded at Temple Studios in June 1996. Unforeseen hindrances determined that the CD saw its release in early 1998! Even so, the release was again praised in countless reviews including a 4K/5K review in Kerrang, and 7/10 review in Terrorizer. Summer 1998 also saw the band embark for the first time outside Maltese shores to play shows in Czech Republic, Slovakia, and Germany. During this tour the band played opening shows for Vader, Dying Fetus, Defaced Creation and Deranged, as well as gigs with Fleshless. New material started to outline a more brutal and heavy approach in the songs. Original formation of the band. Sending caustic shock waves to the local music scene by delivering blistering death/grind assaults, Beheaded has breathed fire ever since. Set in Malta, an island, in the middle of the Mediterranean Sea, the quintet stood firm, against all the odds, and narrow mindedness such an environment generated. Confrontations were the order of the day. A demo tape called Souldead was released in 1995 which put Malta on the extreme music map. Souldead was made to circulate strongly in the fanzine / tape trading circuits of the era.